Are we all over saturated with Christmas cheer yet? We are in the final stretch to this jolly holiday. I have piles of gifts to wrap, stockings to stuff, more Christmas music to listen to (will I ever tire of that? Nope!). We have family to visit! I adore this time of year. It is the time of year when people stop, slow down a little and focus on the people in your life. That means entertaining! I love me some entertaining and I love to be the hostess with the mostess. I do not know if you can tell but I like decorating, shocker… said no one ever. This time of year is crazy hectic for everyone. 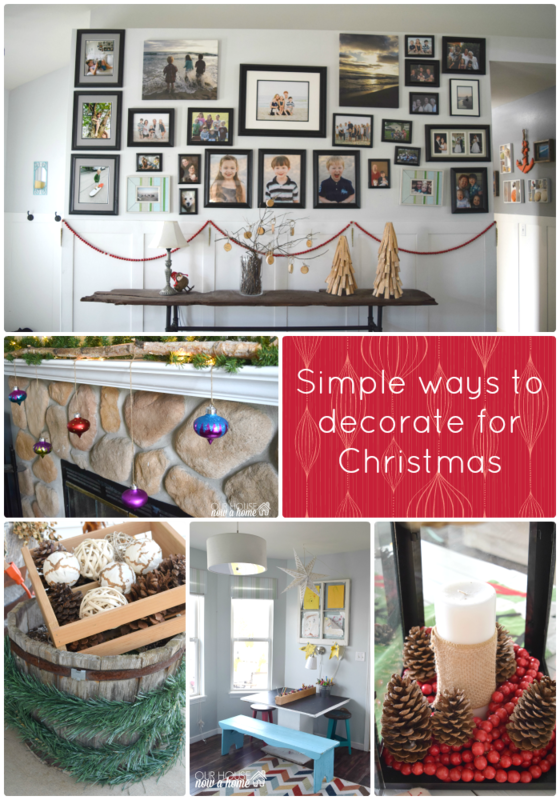 So coming up with Simple ways to decorate your home for Christmas is so important. I did some big projects and decorating to get my home ready for Christmas, you can see my full home tour here. However, doing little things, a few tweaks and additions can be just enough to make your home merry and bright. I am sharing a few of my simple solutions to adding that Christmas cheer we all crave. 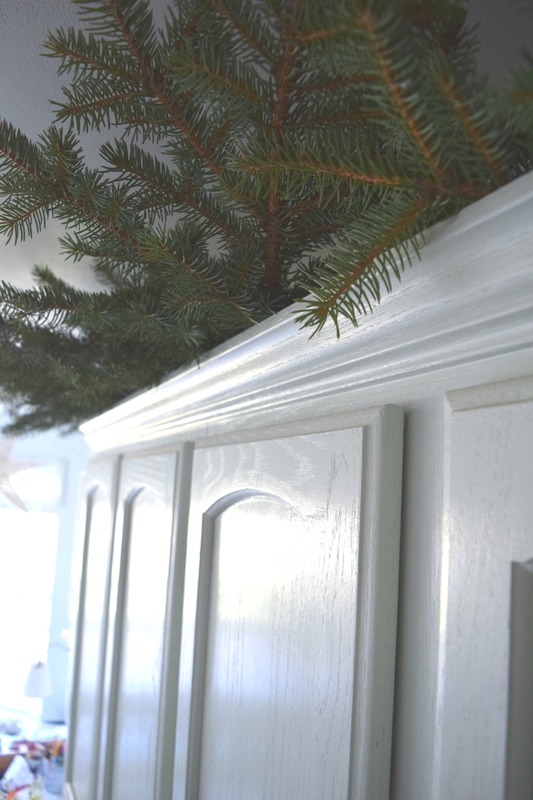 One of the easiest and NO COST things I did in my home was to add the pine tree branches above my kitchen cabinets. I simply cut some from our pine trees and placed them on top of the cabinet. Talk about simple DIY. I am not even sure if this qualifies as a full on project. If you do not have pine trees to cut from, trespass on a neighbors and cut away! Kidding!!!! Ask some nice neighbors or if you have to many home improvement stores sell bundles of pine branches at a discount rate or even free. Most are just remnants from Christmas trees. So I went a little pine tree trimming crazy. Dale had to haul in my loot because he has the muscles and I do not. He was probably hating me because I made him stop and pose with those heavy pine branches. All for the integrity of this blog.,I had to have pictures of it! I need pictures of everything. You do not want to see our personal pictures…. wait that sounded sleazy and questionable. I meant our personal family pictures. If you think I take a lot of angles of home decor imagine how I am with my kids and their sweet faces with their childhood memories. Can we say stalkerazzi?! I love the smell it brings into the kitchen. This is our first year with a fake Christmas tree. Our daughter Nora had a bad allergic reaction to pine sap earlier this year with a rash so she cannot have a pine tree in the home. She cannot TOUCH the pine tree. Nora cannot reach these so I get my fresh pine smell without a cranky and itchy Nora. A Christmas miracle! I got this new light from Parrot Uncle a few months ago. I shared my little dining room revamp here. I added a light green fake garland to the ceiling light. It took me maybe 2 minutes to weave into the ceiling light. I love the little touch of whimsy it gives. I warned you I was going to give you some simple ways to decorate your home for Christmas , are you ready for more mind blowing ideas? 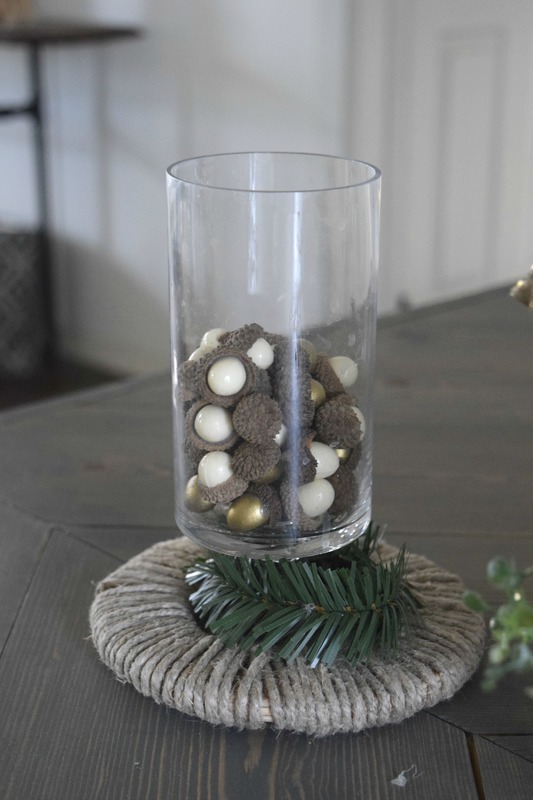 I put acorns and fake greenery around the stem of the glass vase. That is it! Tiny little touches like this can easily be overlooked or make a simple table centerpiece. It is usually small details like this that make the room feel cozy and fully decorated. We have a study off of our kitchen. It is mainly our bigger kids play room. Gone are the days of small toys and blocks. We now have books, art supplies and a place for homework. I like to keep this room as clutter free as possible because kids are messy, art, creativity are messy and reading is messy. You may not think reading is messy, but give kids free range of over 150 books and see what kind of mess gets made. I added a few things in this room to make it feel Christmasy. I purchased this star from Ikea and it glows at night. Giving just a little bit of that Christmas magic we are always looking for. We have this gallery wall in the study that is really special to us. With art made by my Grandma, my kids or memories we have made. I swapped out a few pieces to add a few new additions that are Christmas themed. I made the reindeer art, that can be found here. 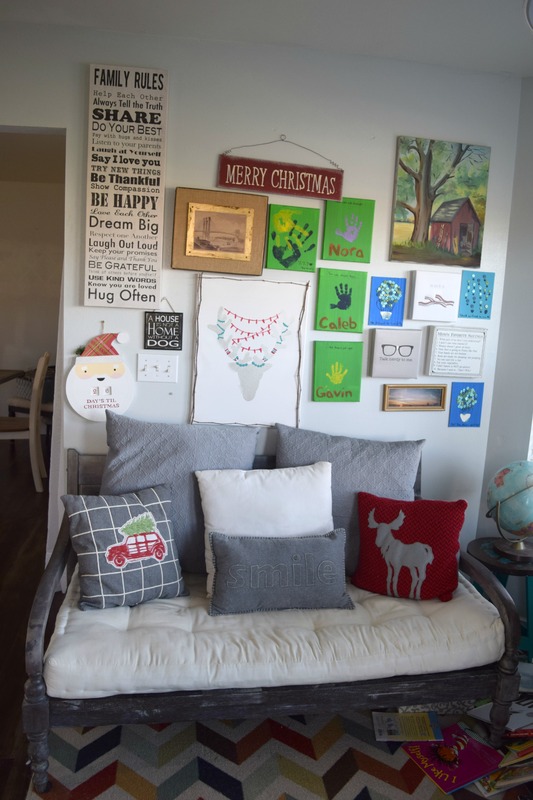 Adding a few simple art pieces to an existing gallery wall is a fun way to mesh your normal decor into a more Christmas feel. Also some throw pillows. You can make them if you are lucky enough to know how to sew. I cannot sew a straight line, I can build a table, built in bunk beds, and lay tile. Sewing? Not so much! I purchased these pillows a few years ago at Target. Another really simple Christmas decor idea is to add little pops of red. I did that in the form of the red beaded garland I hung on my wainscoting. Not much is done in the space but it obviously inspired by the Christmas season. These big over sized lanterns are a great thing to invest in for your home. They can transition to all seasons and holidays depending on what you put inside them. I am not sure if they will ever move off of my coffee table. I adore them there. I changed things out and helped them blend into the Christmas season by adding the same red beads I have draped on my wainscoting. 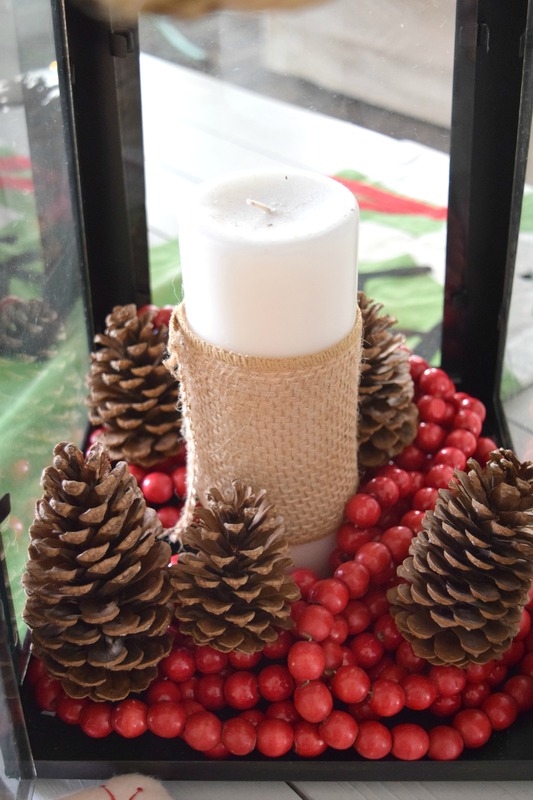 Adding some pine cones and a candle finishes off this low maintenance look. Another idea I had was to put battery operated twinkle lights in here. That is something I will be doing to these next year. I love having a glow in my home this time of year. Using ornaments on places other than the Christmas tree is a creative way to decorate your home. I draped these on a large branch sitting on my mantel. Little things like this really take your home to the next level and will wow your guests. I decorate for guests but most importantly my family. My kids adore all of these tiny additions. They get into the holiday so much more because the house is transformed. We tend to have cold winters here in Wisconsin. Although this year is not the case at all. I keep the outside decor to a few select pieces because this is the literal stomping ground of snow and ice. I do like to have a warm welcome for people though. 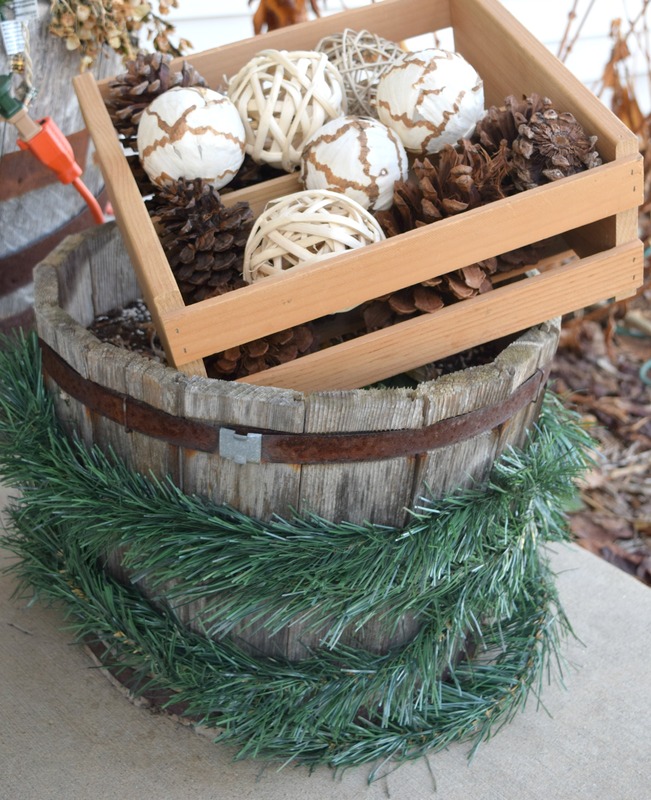 I wrapped some garland around a planter and added this basket full or pine cones. Helping to hide the dormant and appearing to be dead flowers in the planter. They are big planters that stay on our porch year round. So I have to find creative ways to make them blend in during this time of year. 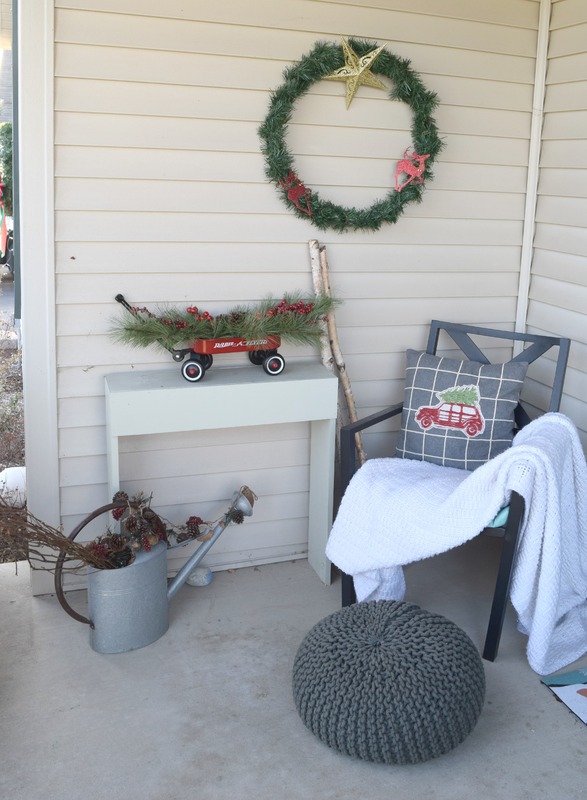 The last simple ways to decorate your home for Christmas I am going to share today is a few more ideas on my front porch. I dressed up my watering can with a garland of pines cones and berries. Just literally laying it inside and around the watering can. The bright little red wagon and some fake greenery with berries is another pure Christmas look. When in doubt, add some red and greenery. That will up your Christmas decor game without fail. Decorating your home for the holidays can get pricey and time consuming. 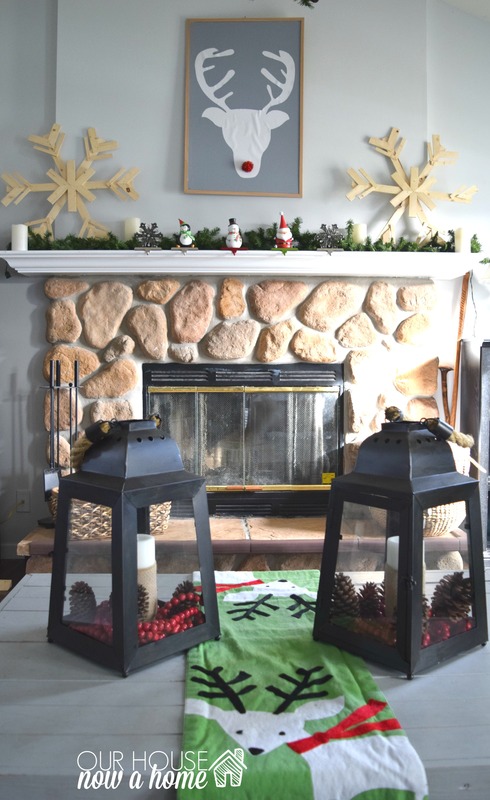 But, coming up with some simple additions, getting creative, planning things out and using what you have are great ways to make your home be Merry and Bright and your halls be decked. Without the fuss, time and money being too much. No one has time for that! What are a few simple ideas you have used to decorate your home for the holidays? These are such great, simple decorating ideas! And the overall look is beautiful! Thank you, the idea of decorating for the holidays can be simple. I LOVE your fireplace arrangement – so simple and beautiful!! I love all the little touches! 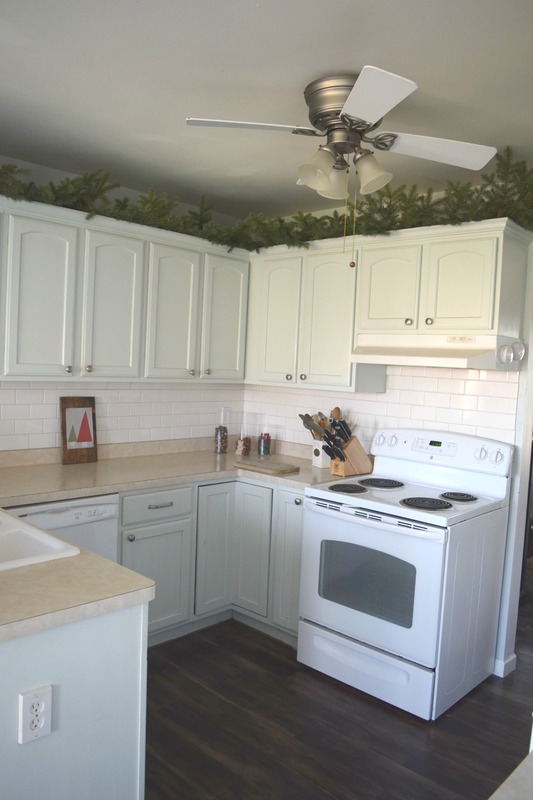 And the greenery above your kitchen cabinets, genius! I used some of our pine trimmings to make my own little wreath this year, it was so simple! Thank you! The wreath that you made sounds beautiful! 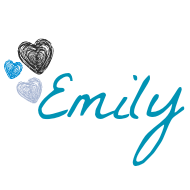 You shared some great tips here, Emily. 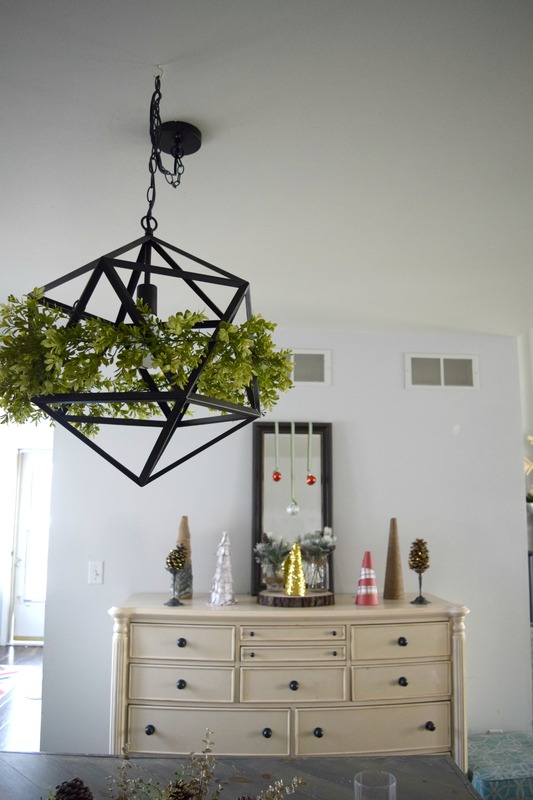 Decorating for the holidays doesn’t have to be complicated or overly costly. 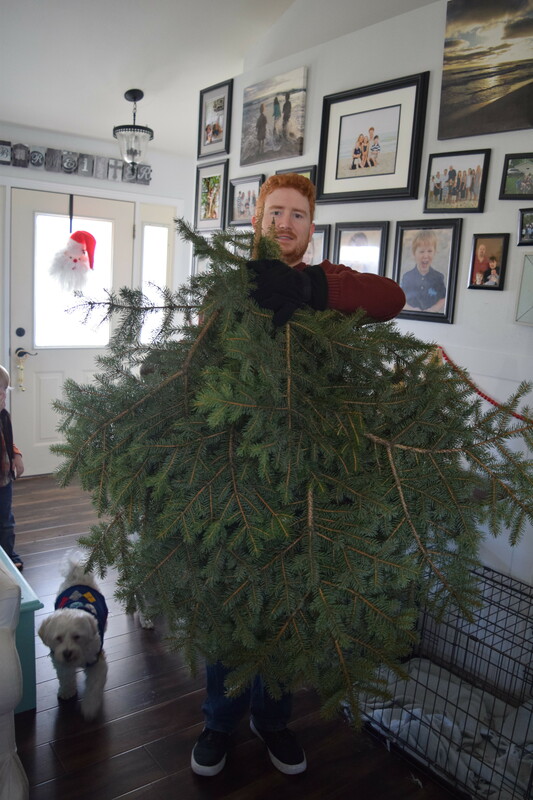 One of the ways, I like decorating for the holidays (like you) is to bring some greenery from the trees/shrubs out back as well as the pine-like tree we have in front of our house. Thanks! I love that idea of bringing in greenery from outside. 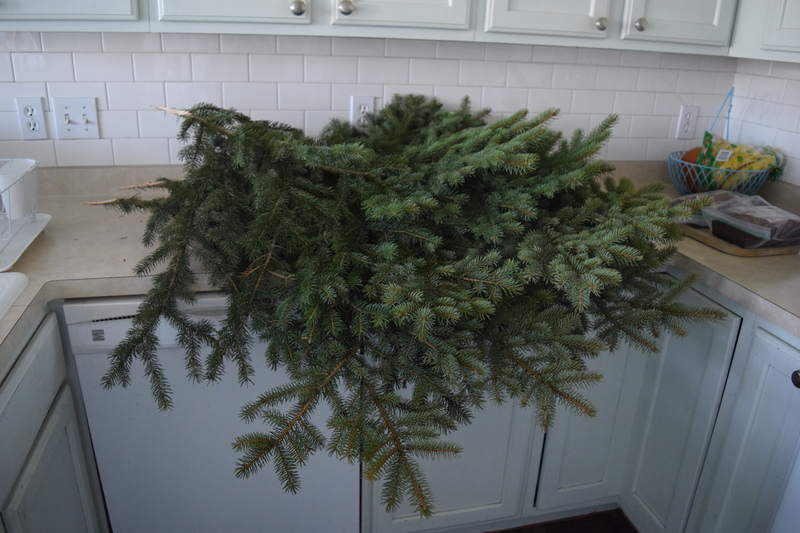 Did all those pine branches make your home smell good? Hi, they made my home smell beautiful!!!! You have just proven how you can decorate easily and simply. 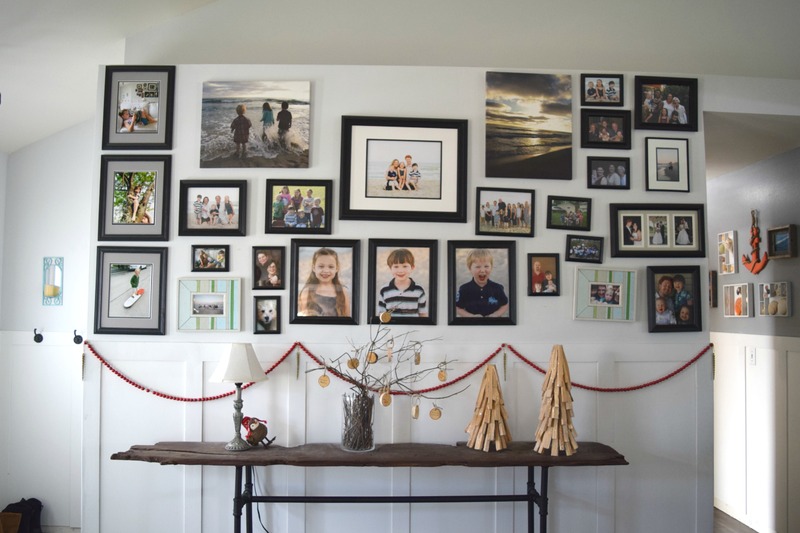 I really like the addition of some Christmas on your gallery wall. Thanks! I love the idea of hanging the ornaments in a window, I will have to try that next year. Candles are a fun way to decorate! Thank you so much, I am glad to have you here! How exciting to be moving! I didn’t do it this year, but spreading greenery around really is a great way for a non-crafty person to make the house look festive for Christmas. We often put whatever kind of greenery is available around all our decorations, and add nandina berries and pine cones too. I love this idea! 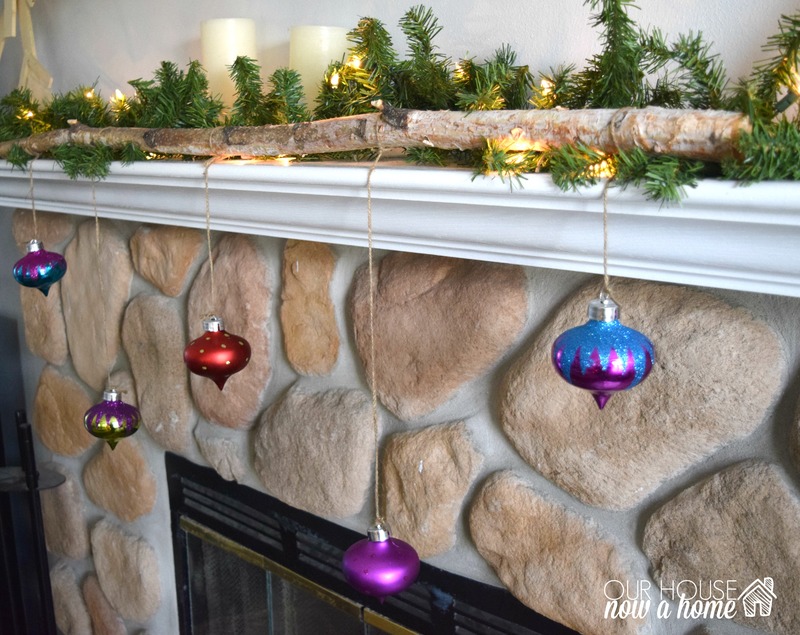 It is such a simple and no cost way to decorate for the holidays. Great ideas! Beautiful! 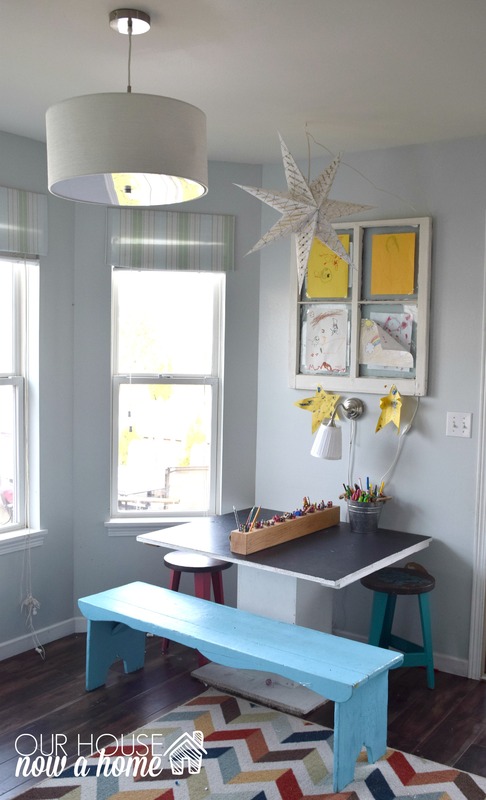 Thanks for sharing these simple decorating ideas! Great ideas there. It goes to show that you don’t have to splurge on a big Christmas tree to get the holiday spirit! Thanks! I was hoping to share just that about not having to splurge. I love your kids drawing table. So cute!